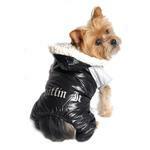 Your pampered prince won't feel like he's "Ruffin It" in our cozy, cuddly dog snowsuit! Tired of those unsightly and painful snowballs that collect on your pup's fur? Our Black and Gray "Ruffin It" Snow Suit by Doggie Design is designed to keep your little guy warm, cuddly and dry on those cold fall and winter days. Your pup will get his second wind even in a blizzard since it is fully lined inside with a very soft and thick sherpa-style fleece. The outer shell is not restrictive since it is made from a soft, flexible water repellant Polyester/Nylon blended fabric. The black and silver colors are cool and masculine. The words "Ruffin It" are silkscreened across the back in a cute font with just a touch of attitude. Despite the sentiment, he'll feel pampered even in "ruff" conditions. 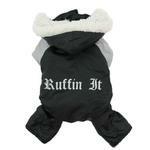 Don't forget to send us your photos of your cute dog playing in his Ruffin It Snowsuit!. Ruffin It Snowsuit by Doggie Design - Black and Gray Customer Photos - Send us your photo! Zita Alegra celebrates the 1st day of 2017 at the park in style. VERY warm. Lambert is a 6 month old shichon, who loves to romp in the snow in his Ruffin It snowsuit. He's also styling in his Zack & Zoey High Top Neoprene Boots. I worry about his paws getting frost bite, but now I don't worry because these protect his paws from the bitter cold. The snowsuit protects him from getting snowballs matted in his fur. The boots are a little high on his leg, so I don't zip them the whole way up. But the velco fastener holds them on tight. Gucci loves his Ruffin It snowsuit. It's been keeping him nice and warm this winter! Posted On 02/28/19 by Tanya K from Milwaukee, WI Yes, Tanya K recommends this product! I got the medium for my Boston Terrier & it is a little snug in the chest area, even though he is 19". I didn't want to go one size up because then it would of been too big and cover up his backend. It is really well made & warm, my only complaint would be that the fuzzy part on the arm keeps getting stuck in the velcro. Otherwise its perfect for letting him outside in the winter & keeps him warm. Posted On 12/29/18 by Jackson from Jackson, MS Yes, Jackson recommends this product! Posted On 11/04/17 by Cindy B from , PA Yes, Cindy B recommends this product! Perfect fit and keeps my Boston warm and comfy while we are outside. Nicely made!! Posted On 10/12/17 by Ina K from , NY Yes, Ina K recommends this product! He is a big chested boy and it fits perfect. It covers all for legs with nice coverage in the rear to protect his hips. So important, in the colder months and should not be neglected. He doesn't normally like hoods but he doesn't mind this one. Must be the soft lining! I recommend it for Schnauzers! This is a very popular item! When I first saw the suit, I knew my Yorkie would be nice and warm in it. At the time they were sold out of the black and gray so I purchased Pink. It didn't matter the color and pink was beautiful. I now have each color because of the warmth of the interior of the suit. I purchased one for my daughters Schnauzer. He is very hard to fit because of his chest and to my surprise fits him perfectly too. This protects both front and rear legs. The hip coverage is great. This is so important to cover all exposed body parts in cold weather. I also purchased the rubber shoes and the fitted shoes. Just allow a little room for the dogs nails. They both are sitting perfect for the cold weather that is coming! Posted On 02/27/17 by Cijai B from , Yes, Cijai B recommends this product! Finally, a snowsuit that works and she'll wear! I've tried several different snowsuits and always had problems with them, partly because my little Zoe has an unusual body shape, partly because she's so little, partly because she's so spoiled ;-) But we live in a place with 5 months of winter, snow, ice and minus 30 degree temps so winter wear is essential if she is going to go outside at all. This snowsuit is perfect for her. It covers her entire back and most of her legs and stomach. The front legs are too long but a couple of stitches fixed that. And the material is so soft and supple that she hardly notices it (as opposed to the stiff suits that she refuses to walk in) while it creates a wonderful barrier to the wind and wet, and the fleece lining and hood keep out the cold. Posted On 01/19/17 by Lisa S from , Yes, Lisa S recommends this product! Very stylish and warm. Fits nice and I really like that it has legs. My 5 lb. Poodle gets very cold in the winter and this is keeping her toasty. ?? Posted On 01/02/17 by Denise N from , NY Yes, Denise N recommends this product! Zita Alegra celebrates the 1st day of 2017 at the park in style. She is wearing a size small, she is a 7lb min pin and even had room for a light weight sweater underneath...wish this was available years ago. Posted On 12/29/16 by RIta I from Chalfont, PA Yes, RIta I recommends this product! I purchased this for my daughters boy dog. My dog has one in pink. They are siblings. They look adorable and warm in this great snowsuit. Posted On 10/26/16 by Fuzzy from , Yes, Fuzzy recommends this product! Lightweight but warm and soft. Love how it keeps all four legs warm. Posted On 10/24/16 by sonya j from Clinton Township , MI Yes, sonya j recommends this product! OMG! This is the cutest coat and it looks so cute on Teddy. I will be sending in a picture. Cute design and super warm! Hope my little guy gets to wear it this winter! Posted On 10/07/16 by Lilianne L from Hobe Sound, FL Yes, Lilianne L recommends this product! Out of five coats and parkas we've tried on our Maltipoo I bought this one because it was the back was long enough and was easy to put on. I'd have chosen a Hurta but it took too long to zip up and our dog is very impatient when being dressed. The outer nylon material of the Ruffin' It Snowsuit is very thin so I'm afraid it will tear easily if it gets caught on a branch, and the thing I dislike the most about this coat is that the Ruffin' It' logo is spread across the back. I don't like wearing company advertising, and I don't want my dog wearing it either. But, the coat is cute and warm. was a big reason for our not keeping it. Because the lining and trim are white it would definitely require frequent washing and doing so by hand is inconvenient. Posted On 04/24/16 by Amy L from , OH Yes, Amy L recommends this product! Nice quality snowsuit. I ordered a small for my yorkie who is 7.4 lbs and it just fit, so I am going to reorder a small/medium. This snowsuit is a great fit in an X-Small on my 3.5 lb chihuahua. It comes down both the front and hind legs and is fleece lined throughout for extra warmth. The hood detaches with a zipper. I'm very pleased with the quality of this item and glad to have something to keep our small dog comfortable in our cold climate. Posted On 04/10/16 by sandy from iowa city, IA Yes, sandy recommends this product! Posted On 04/05/16 by sokha l from Long beach , CA Yes, sokha l recommends this product! Great price on sale and good quality product. Will surely keep her warm. Pimpin! Posted On 03/26/16 by Gina M from Jackson Heights, NY Yes, Gina M recommends this product! Posted On 03/20/16 by Lisa B from Liberty Twp, OH Yes, Lisa B recommends this product! This is so cute and it looks like it is going to fit my Shih Tzu Mickey great. His sister Mizti has one and she is so cute in it! Love the sale price that I was able to buy it for. I purchased this for my little guy Chulo and I just love it. Chulo weighs 16 pounds and according to the measurements I needed to purchase a large for him but once I received it it was too big. I then reordered it in a size medium and it fits perfect. I really like this snowsuit. Posted On 03/14/16 by connie b from waynesboro, VA Yes, connie b recommends this product! snuggly-beautiful and very functional. Fits my little girl very well. Posted On 03/12/16 by Harold F from Ridgewood, NY Yes, Harold F recommends this product! This is really a nice product. While it will not be used until next year I am sure that it will keep my dog very warm and dry. Posted On 03/09/16 by Joan K from Lakewood, OH Yes, Joan K recommends this product! 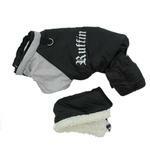 Will keep your dog toasty warm in the cold temps and free of so many ice balls forming on their body and legs. 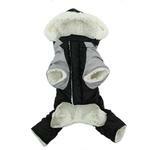 Especially good for small dogs that love to play in the snow but get cold easily! Charley weathered a 32" snowfall in his new Ruffin It Snowsuit. Being a rough little guy, it didn't come off when he tried every snow maneuver possible. He also stayed snuggly warm. Posted On 01/31/16 by Poodle Mom from New York, NY Yes, Poodle Mom recommends this product! This is a great snow suit. I had to get the black for my girl because the pink was sold out :-( Works well. It runs slightly on the snug side. Posted On 12/14/15 by Diana P from Grand Ledge, MI Yes, Diana P recommends this product! Love it and I was surprised to see the lining was the white lamb stuff that will be nice and warm. Good product!! Posted On 11/09/15 by sheila m from howell , MI Yes, sheila m recommends this product! Austin will be snuggly warm outside with his super soft lining snowsuit . Posted On 02/04/15 by BRUCE H from POLAND, ME Yes, BRUCE H recommends this product! It's not often my wife and I are amazed at something we have ordered online. This snow suit is truly one of the best things we have purchased. It fits our little dog perfectly and will keep him nice and warm. He only weighs 4 pounds so can get cold quite easily but now he can go out in the winter and not be stuck inside the whole season. Posted On 01/08/14 by carolynne breaux from akron, OH Yes, carolynne breaux recommends this product! I really love this snow suit. It fits nice and snug, it is not too heavy yet warm as it is lined with sherpa fur. entire body of dog is covered so he is not wet or cold. It is exactly like picture and worth the money. I have 2 Bichons and I feel great now when they are outside romping in the snow and cold temperatures! The only problem was that the sizes I needed were sold out. I'll see how the one I ordered works.